Don’t Let Passive Aggressive Behavior Destroy Your Marriage! The communication in your marriage has become strained. You’ve begun to avoid her; your wife continues to call you a passive aggressive husband. You are hoping that your approach will send her the message that you need peace and quiet. It is not working because discussions are escalating into fights. It’s a vicious cycle perpetuated by her feeling isolated and protesting loudly, provoked by your silence, which prompts you naturally to take refuge in more silence. Meanwhile, your relationship continues in a downward spiral. This revolutionary system comprised of four dynamic components will change your relationship forever. In it, you will dicover how to identify and change behaviors produced by an old approach that simply isn’t working. After applying this proven program, you will know how to best approach your wife, how to solve differences between you, and how to express your needs so they are heard and acted on as part of the marriage deal. This program was developed by a team of relationship experts, and has been perfected over the course of 6 years. It has changed the lives of hundreds of people and played a part in healing countless relationships, providing them with the right approach and the right tools to produce positive change. When you immerse yourself in this pioneering program, you’ll begin walking on a structured path that will ultimately result in understanding the origins of your passive aggressive behaviors, being able to use better communication skills here and now with your wife, feeling more comfortable expressing your true feelings, and enjoying your relationships more than ever before. You’ll begin by taking The Passive Aggressive Self Assessment, to identify whether or not you have common passive aggressive traits. By understanding what these traits are – and if you possess them or not – you’ll understand how to deal with and correct those characteristics. It is the foundation for the rest of the program, because it reveals to you the hidden childhood roots of some behaviors that were once useful but today are counterproductive. This psychology-based test is done by yourself, in privacy. I got to take the test using an invented name…when I got the responses, I was shocked at the profile of my own behaviors described there…What I’ve told myself that were protective behaviors, like not telling her about my work difficulties, ended up being a huge problem when she discovered that I almost lost the only income we have. The worst aspect is my automatic tendency to block whatever she proposes… I know how she is expecting me to behave, and when I find this expectation, immediately do the opposite. My reaction is so fast that I haven’t observed it before…I covered it up thinking that it was constructive opposition, but she calls this attitude of mine “sabotage.” The truth is that when I come up with something different to create a fight,we don’t get to finish any of the home projects waiting for us. NOW, when I know what needs to be done and still wish to retreat and be alone, and let her work by herself…I see this attitude as real sabotage, and remind myself that this option is no longer a choice for me. Success stories of the men (and their happy wives!) who have used this model to change their lives and save their marriages. After identifying potential passive aggressive traits, you’ll get to the core of the program written by relationship expert Neil Warner. “The Silent Marriage Solution: How stopping passive aggression improves your relationship, and makes your marriage stronger,”” explores how passive aggression starts and how you can correct it. The book contains practical applications of each concept and are easy to read and understand. No psychology classes or dictionaries are required! It is your guide to understanding and changing your communication style from passive aggressive to a healthier form that will benefit both you and your wife. Revolutionary ideas that work to produce steady, positive behavioral change. and makes your marriage stronger. 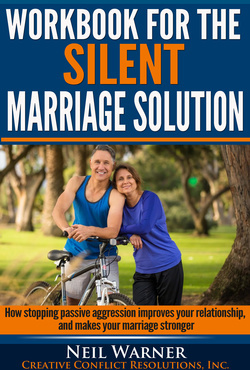 To maximize your benefits from the book, you will also receive the companion manual: The Workbook for The Silent Marriage Solution: How stopping passive aggression improves your relationship, and makes your marriage stronger.” Use this powerful tool at the end of each book chapter to further reinforce key concepts and apply what you’ve learned to your own situations. FEATURES: The exercises in the workbook show you how the book’s lessons apply to everyday life. Use the workbook to gain valuable insight about past experiences and understand how those experiences have shaped the way you think in the present. For certain exercises (discovering the roots of hidden anger and discovering the past anger targets, for example), you will be personally guided by your coach. They will provide you with specific insights about your situation based on many of the answers and scenarios you create in your workbook. All those past years, I have been in my “self-protective mode” instead of being in a shared perspective of committed relationship…Never really knew what being married entails! And, what is the point of defending myself from her? She is not my parents..
With this original program, you don’t just get books and self-study materials. We’ll work directly with you, one-on-one, to illuminate the core concepts of the program, apply them to your own solutions, and help you permanently change your life and relationship for the better. Identify the origin of your mental models and current beliefs. Link your current beliefs and defenses to past experiences. Identify what creates problems in your present situation and find positive tactics to correct them. b) When we agree on something, to prevent my brain from twisting the decision and remembering differently, now I’m taking notes, and thus I will not cause her to be upset. Slowly she has watched me do this battle with my own tendency to sabotage her, and now, she can’t help but treat me differently! Wow! What a find this one was for our relationship! If your relationship is suffering because you are accused of being a passive aggressive husband, you know how frustrating and lonely it feels. The good news is that there is a solution. Our solution has helped hundreds of men fix this problem, change their lives, and save their marriages. It’s in your hands to act now and avoid further deterioration of your marriage. 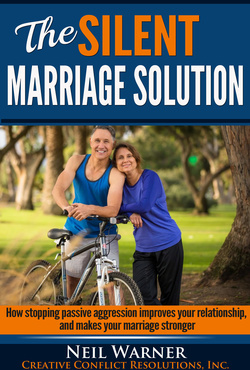 The regular cost of producing The 4 Steps Relief Plan for Passive Aggression, is $495.00 This is the complete investment necessary for transforming your marriage into a warm and supportive relationship…any time. Because we are now in Launch Week, we have a special offer for you, giving you all this value for a very convenient price! NOW, you can join “The 4 Steps to FREE Your Marriage of Passive Aggression” during this special promotional week for only $395.00. There’s No Risk Whatsoever! In fact, I’m so confident that you’ll see improvements in your life and your marriage from this program, that I’ll give you a 30-day guarantee. If you follow the program and you don’t see positive changes happening fast in your marriage, occurring within the first 30 days, I’ll refund your money. So join us now while this special price is still available, so you can address the need for a different approach to your marriage! You even get back your wife’s support for this specific process, simply because the other results show her that you’re now on board and deeply involved! 2 Responses to Don’t Let Passive Aggressive Behavior Destroy Your Marriage!